Here are 7 key things that your Online Bus Ticketing Software should have for you to be successful. You software should allow your passengers to review a number of different journey options to allow them to determine the best route and time to accomplish their journey. The system should allow passengers to make payment immediately whilst they are online booking the tickets. Online ticket payments provides passengers the convenience and comfort of knowing their journey is secured, whilst at the same time reduces the likelihood of them looking at at alternative travel options. Online payments is likely to increase your revenue whilst at the same time reduces the cash/payment handling at the front line. The passengers should receive an email confirmation so that they fully understand what travel they have booked. An email also allows them to refer back to their booking at a later date and will reduce the number of customer queries. A passenger manifest must be able to be produced for the driver or if available, the bus conductor or host. This makes it quicker and easier for them to verify the correct passengers are boarding and departing the bus at each stop. Passengers will consider online booking as just one more channel for them to communicate and transact with your business. This means that customer service staff who answer telephones, work at ticket desks, etc. need to be able to review booking and travel information and make any necessary changes that are allowable within your bookings and reservation policy. Your bus ticketing software should provide a number reports that allow you to plan both short and long term. Such reports include capacity reports, that allow you to see how much spare capacity a vehicle has today or in the retrospective sense, how much capacity a vehicle had for a similar trip in the past. This allows you to determine if additional capacity needs to be made available. Of course online bus ticketing software is only a success if you get paid quickly. You need to be able to ensure that the passengers fares gets to you quickly while at the same time maintaining a small float for any refunds that may need to be issued. Well that’s the 7 keys to success. There’s plenty of other things to consider, but having these 7 fulfilled will put you in a good position. The diagram above provides a simplistic representation on how vehicles positions are determined and then combined to provide real time transit information on a mobile phone. Firstly the vehicle typically has an on-board Global Positioning System (GPS) device. The GPS device uses signals from satellites, telecommunication towers and even local wifi to determine where the vehicle is physically located. The amount of signals available will depend on the vehicle, it’s location and the specifications of the GPS device. The greater number of signals that the device has access to, the more accurate it can be. The GPS device will determine its position in terms of latitude, longitude and also provide a level of accuracy. 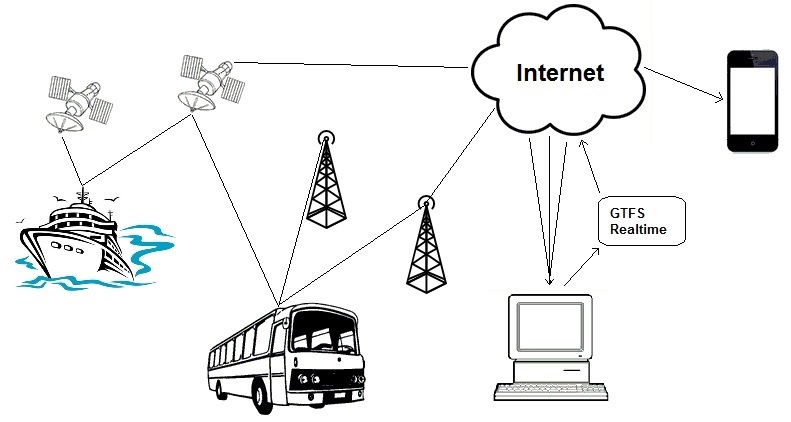 The vehicle will then transit the GPS location and some identifying information (e.g. a vehicle id, route id, etc.) via the internet to a computer. The computer then combines a variety of vehicle’s GPS positions to produce the data in the form of a GTFS real time data feed. This data feed’s standardized GTFS realtime format makes it easy for Google and the various transit apps developers to display many bus, ferry, train and public transport companies information in a consistent way. The position can be displayed on laptops, PC’s or tablets. As the vehicle moves along, the updated position is passed through this process, allowing the end-user to identify the location of the vehicle and make informed decisions about their travel journey. Well… that’s the simple explanation. We’ll delve into the detail in future posts.